Concrete is a standard building material. A good portion of every home built consists of concrete of one form or another. Concrete in outside features like driveways and steps is also the material of choice for these home features but unlike your basement floor these are exposed to the wear and tear of the elements. Constant bombardment from our Canadian weather can lead to pitting, cracking and flaking, eventually rendering the concrete unsafe or at least unpleasant to look at. 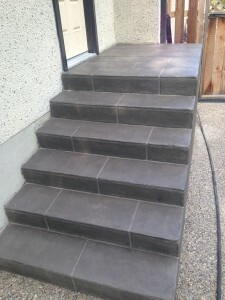 Taking down and rebuilding a heavy concrete step for example can cost thousands of dollars not to mention days of demolition, interruption and reconstruction. Hardscapes can show you another alternative. A concrete restoration might be just what you need. The cost is about half of a removal and re-installation and the result is considerably more pleasing to the eye. This restoration was $1800.00 a far cry from the $3000.00 quoted for demolition and re-construction.